Golf carts might not look like a necessity for most golfers out there. Well, that is acceptable for those that are just starting out. But for serious golfers who have a lot of gear to move, a golf cart is almost a must-have. For better performance on the course, it is important to select the right golf cart tires. The tire you choose should adapt well to the terrain, weather condition, and give good mileage before needing a replacement. Price is just but among the many factors that you need to consider when purchasing golf cart tires. For instance, you might want to check the amount of traction, stability, and support you get from a particular tire. Golf tires are not made the same. You will find them in different types, sizes, and tread design. As you can see, there is more to choosing the ideal golf cart tire than just a consideration of the price. Tired of tires that wear out every season? Here is a list of the best golf cart tires that will help you get the most out of your ride. This run-flat tire has the capacity to support your golf cart with low or no pressure at all. It lets you drive on for miles even if you get a puncture. The run-flat design gives better stability after a blowout. This tire has a chevron tread pattern suitable for both mud and snow covered surfaces. This pattern aid in fast water displacement. The tire is compatible with 8-inch rim and measures 18 inches in diameter for added stability. 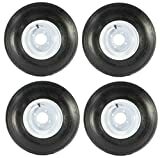 This is a set of 4 pneumatic golf tires. The tires come already inflated and pre-mounted on rims. These tires are 18 inches in diameter, a wide design that gives increased stability. The tread pattern gives good traction both on turf and pavement. 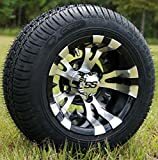 Golf carts that these tires fit include Yamaha, Club Car, and EZGO. You don’t need a lift kit to fit these tires, which is a great convenience. Greenball golf cart tire comes complete with a rim and fully inflated. The tire is compatible with standard size golf carts. It has a classic sawtooth tread pattern that gives a smooth rolling performance. This tire is great for small industrial applications and is recommended for use on paved surfaces. It has a maximum load rating of 815 pounds, which is enough to support you and your golf gear. The maximum pressure rating for this tire is 122 PSI. This is a free-maintenance tubeless tire. It has a run-flat design, which means that punctures don’t affect the performance and support it gives. The run-flat design combines with 18-inch width to give greater stability. It is a good option for uneven and bumpy surfaces. The tire has a sawtooth tread pattern that doesn’t sacrifice comfort during wear. It supports up to 815 pounds and is tough enough to be used as a replacement tire for tractors. This tire gives extended service life on paved surfaces. The tire has multi-circumference grooves for faster water displacement and dirt evacuation. The grooves give enhanced stability, even on bumpy surfaces. There’s a tread-wear indicator that tells you when the tire needs replacement. This is a heavy-duty tire designed to support heavier loads. Apart from course use, it can be used on commercial and residential vehicles. This tire fits on a 10-inch rim. 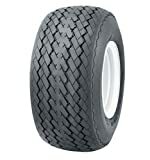 This is a heavy-duty pneumatic tire that comes inflated and mounted on a rim. 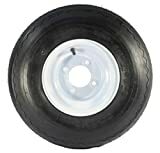 It is an 18-inch wide tire ideal for small yard equipment, such as carts and wheelbarrows. The tire has a ribbed tread design, a durable option that provides better traction and stability. The heavy-duty rubber used on the tire gives good resistance to punctures and add more life to the tire. This golf cart tire can be filled to 22 PSI and supports loads up to 815 pounds. This tire comes fully mounted. It has a wide design that is gentle on your lawn. The tread design used on this tire gives better performance on turf compared to standard sawtooth tires. It offers good traction on paved surfaces. Since it comes fully mounted, there is no need for a lift kit. It is compatible with any stock golf cart hub. Vampire golf cart tire is a low-profile tire that gives maximum stability on most surfaces. It comes already mounted on a machined rim that has a luxurious chrome finish. No lift kit is needed. What you do is just bolt it on and you are good to go. The tire has an approved tread design that gives sure grip and takes longer to wear. The tire comes aired up ready for use right out of the box. It is a good option for riding smooth and in style. This tire fits 10-inch golf cart wheels. The tire has a low profile that gives good performance in both wet and dry conditions. You can use it on turf or paved surfaces. Circumference grooves help dispense off water and dirt with ease. The grooves let you ride with confidence along course edges. This tire is 18 inches in diameter and comes in a set of 4.